Another option for those wanting to track their cycling journeys, especially if they’re also a runner—the Garmin Frontrunner 110 gives access to “just the facts”: distance and speed. But the slim watch-like monitor still has access to the super-cool Garmin Connect website to download, evaluate, and boast your ride, run or athletic activity. Plus, it tells the time! A hands-free speakerphone for your bike! 10 hours on 4x AA batteries and an optional bike mount. Listen to tunes while you ride or take a call at a stop sign. Earlier this morning the KXL newsroom received a tip from an, understandably, frustrated listener who couldn't get through to DirecTV support... seems the caller's DirecTV HD DVR had locked up and they were unable to change the channel. Some surfing of the Internet this morning helped me discover the problem was, apparently, a software update overnight blast to the receivers that didn't quite work as planned for some customers. HDDVR customers: If your HDDVR will NOT power on, unplug the unit from the wall, wait 15sec, then replug, & repeat 1x to restore service. First off, don't panic. Often you can make matters MUCH worse... we've all torn apart the home entertainment system or ripped apart our computer to discover it was a cable that fell out of the wall, or another simple fix. Take a deep breath, relax, analyze the problem systematically and don't add to your problems. Power cycle everything. Sure, your monitor might appear to be working just fine and your lamp doesn't *appear* to be having troubles, but sometimes it's best to take a few extra seconds to disconnect power (unplug it from the wall socket or power strip completely) from the electronic gizmo causing grief, wait 30 seconds, and plug it back in. Be patient. They may walk you through the exact same things you've already tried-- but remember they're trying to help. It will take a few extra minutes, but best to try again and be confident. And now, just in time for World Cup Soccer, your DVR is back up and running! Right? For more on this and other tech stories, tune to Newsradio 750 KXL (750 AM in Portland, OR and online at KXL.com) each Friday morning at 6:20am & 8:20am. Does Sprint's New 4G EVO Work in NA's Tallest Building? 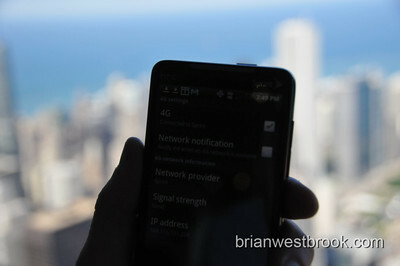 I recently received a pre-release demo of Sprint's new EVO 4G mobile smartphone. I'd heard the device would be the world's first 4G smartphone, operating on faster data networks available in select markets-- but previously only available to mobile broadband cards and routers. With a freshly-charged EVO in my pocket (I immediately fell in love with the mobile hotspot application piggy-backing my iPad WiFi to use the EVO's faster data connection), I thought I'd bust out of the Northwest and try another Sprint 4G city: Chicago. Aside from being the ultimate travel companion (often the built-in 4G was faster than the hotel's own WiFi) with it's giant movie-friendly screen, the coverage was much better than I had expected. Would it work on top of The Sears Willis Tower, 103 stories up and anchoring the Chicao skyline? In other news... I did stand out on THE LEDGE. Those photos will follow at some point. Obviously the BEST solution is to talk when you're done driving... But if you need to stay connected while on the road, there are some technology solutions to make it safer. Pairing your device via. Bluetooth is actually quite easy... most phones offer on-screen menus, and many manufacturers are offering step-by-step guides to make it simple. Of course your phone carrier's store is a good place to go if you need help (or to try on devices). Devices are either handsfree headsets or in-car / portable wireless speakerphones. Of course sometimes the simplest solution is the wired headset your phone came with.... nothing to charge! Fun names such as "The Ace", "The Thinker", "The Bombshell"
Cost varies, can be a few hundred with new cars, thousands to "retrofit"
If you have questions, or need more information... hit me up on Twitter: @BMW or send me an email (listed above).